A former director of Rangers is suing the chief constable of Police Scotland and the Lord Advocate for wrongful prosecution, BBC Scotland has learned. 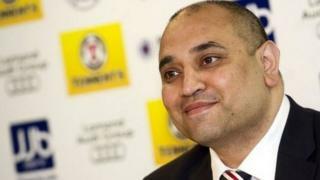 The club's former commercial director Imran Ahmad was wanted in connection with fraud charges relating to the purchase of the club's assets in 2015. However, the charges were eventually dropped. BBC Scotland understands that Mr Ahmad, who now lives in Pakistan, is looking for damages of £2m. The former Rangers chief executive Charles Green is also suing Police Scotland for wrongful arrest after his charges were also dropped. Mr Ahmad's lawyer Eric Baijal told BBC Scotland: "We can confirm that Imran Ahmad has initiated legal proceedings against the chief constable of Police Scotland and the Lord Advocate in relation to what he argues was a wrongful prosecution brought against him. Charges of fraud were also brought against the club's former owner, Craig Whyte, but he was cleared after trial at the High Court in Glasgow in 2017.